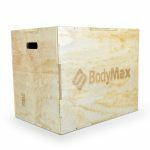 Plyometric boxes or plyo boxes come in different shapes and sizes, it can be anything from a box made from plywood to a stack of high quality foam boxes. Whether you’re familiar or new to it, plyometric boxes have become increasingly popular and many people use it as part of their training regime. You can practice a wide range of exercises with a plyo box, but the one that most people would at least use it for would be box jumps. 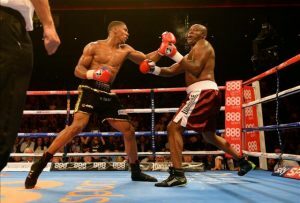 If used effectively, you can improve your strength, balance and power which is why many athletes including boxers and MMA fighters reap the benefits by doing plyo box exercises. 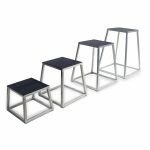 What Are Plyometric Boxes Used For? Building explosive power – As mentioned above a common exercise people would do on a plyometric box is box jumps, which is one of the ways to build explosive power in your legs. Improving balance – Many of the exercises which can be performed on a plyo box involve transferring your weight which requires a good level of balance, so as a result your balance will progress as well. Simplicity – You don’t need several machines or pieces of equipment, plyo box workouts can be done indoors or outdoors. All you need is a plyo box and that allows you exercise in a different way with the different variations you can use utilise the box. Height – Choosing the right height will depend on what you want to use it for, different exercises will require different heights for it to be the most effective. If you’ll be using for exercises where the required height will be the same such as decline push ups and step ups then you might be able to get away with just buying a singular plyo box. On the other hand, if you want to use it for a bit of everything then your box jump is likely to require a higher height than what you would need for decline push ups, so you might be better off buying a set of plyo boxes. 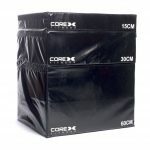 Stackable – Only the foam plyometric boxes will allow you to stack it on top of each other. 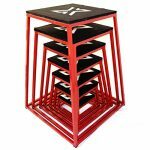 Stacking them allows you to create different height levels to suit your needs, stacking them will also allow you to create a very high platform level that a single plyo box won’t come close, ideal if you have a very powerful box jump. Material – When doing any type of training in the gym, you’re bound to come across some injuries at some point. Exercising with a plyo box has a higher chance of potential injuries which could only be minor but if the risk can be reduced then I’m sure you’d prefer that. Choosing a foam plyo box will reduce a lot of potential injuries, a common injury is when doing box jumps their foot will clip the top of the plyo box which causes them to fall forward and scrap their shin on the top of the box. If the material was steel this would cause a lot of damage whereas a foam box will probably let you get away completely injury free. Non-slip surface – If you manage to jump and land on the surface of the box but end up slipping then this can really shatter your confidence or even worst cause serious injuries. It’s also important to wear the correct footwear as this can help prevent potential slips or falls.